For those who may be looking for tartan fabrics in Cotton, Polyester, or Wool blend fabrics we now offer the following in a limited range by special order. These fabrics are authentic tartan patterns woven in the United Kingdom by modern mill looms. Delivery may take 4-12 weeks depending upon the tartan selected and the fabric availability. light home fashions when lined. Limited stock range available. Anderson, Baru, Bath, Bedford Check, Black Watch, Black Watch Mini, Buccleuch, Buchanan Anc, Cairn B+W, Caledonia, Canpbell Anc, Campbell Mod, Cladish, Clark/Clergy, Colquhoun, Douglas Anc, Douglas Mod, Farquharson, Fergh=guson, Fraser Anc Hunting, Fraser Red, Gem, Gordon Mod, Gordon Dress, Gordon Red, Graham of Mentieth, Gunn, Hamilton Red, Hay Anc, Holyrood, Hunter Modern, Lindsay, Lindsay New Mod, Lindsay Mod New Mini, MacBeth, MacDonald, MacDull Hunt, MacIntyre New Hunt, MacKay Anc, MacKenzie Dress, MacKenzie Mod, MacKinnon Hunt, MacLean Hunt, MacLeod Hunt, MacMillan Black, MacNaughton Muted, MacPherson Hunt, MacPherson Red, MacQueen, Malcolm, Menzies Black, Murray of Atholl Anc, Murray of Atholl, Oakleigh, Prince of Wales, Ramsay Blue, Ramsay Blue New, Robertson Red, Soctlands National, Stewart Dress, Stewart Black, Stewart Camel, Stewart Hunt, Stewart Navy, Stewart Royal, Thomson Camel, Thomson Grey Thomson Grey Mini, Wallace Red, Wallington, Warrior Purple, WestgateKilsney Navy Check. range, suitable for light clothing and or home fashions. 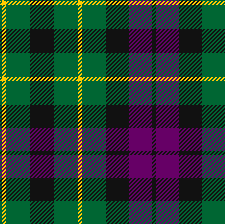 Custom weaving of all registered tartans is available by special order. This service requires that you purchase a minimum of 15 metres and incures a 40% surcharge. These requirements apply to all three of the above fabric weights. Delivery from the United Kingdom will take from 4-12 weeks minimum and depending upon the quantity of fabric desired may take longer.